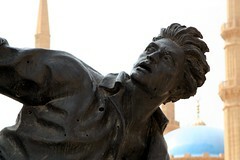 Martyrs’ Square has always been the heart of downtown Beirut. In the dying days of the Ottoman Empire, a number of prominent Lebanese nationalists were publicly hung there. Shortly after the collapse of the Ottoman Empire, the square was renamed and a statue erected to honour the executed nationalists. Unfortunately, Martyrs’ Square marked the frontline between mostly-Muslim West Beirut and mostly-Christian East Beirut during the civil war. As such, almost every single building surrounding the square was totally destroyed during the 15 years of fighting. The now-much-larger Square has since become the focal point for both celebrations and protests. During the ‘Cedar Revolution’, which forced Syria to withdraw the last of its troops from Lebanon, up to 1.5m people (about one-third of Lebanon’s population) gathered in the Square to demand the departure of Syrian troops. The Martyrs’ statue remained standing during the entire civil war, though it became increasingly damaged as the conflict wore on. It remains standing in its damaged state today as a reminder of the lunacy of that period.